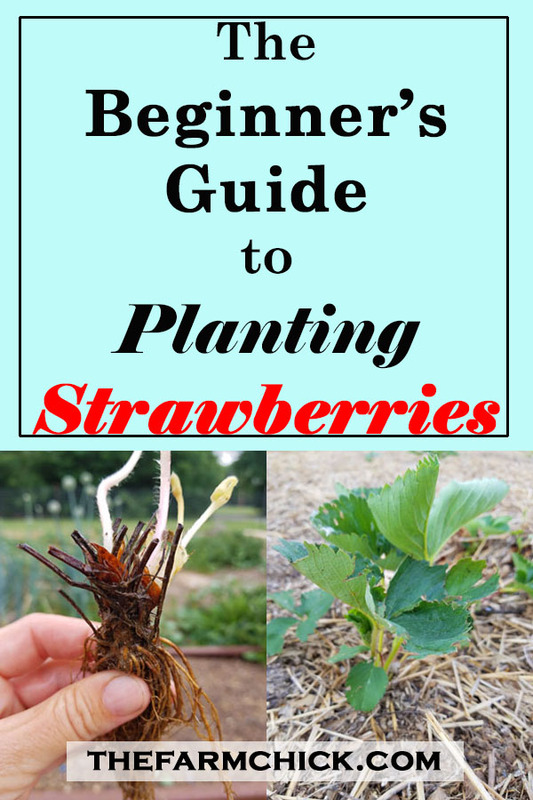 In light of the fact that I had to replant my strawberries recently, I thought I’d give you the lowdown on how to properly plant strawberries! Before we get started, let me give you a little lesson on strawberries…. There are two main types- June bearing and everbearing. June bearing strawberries will give you one giant crop in the spring (which for us is the end of May). 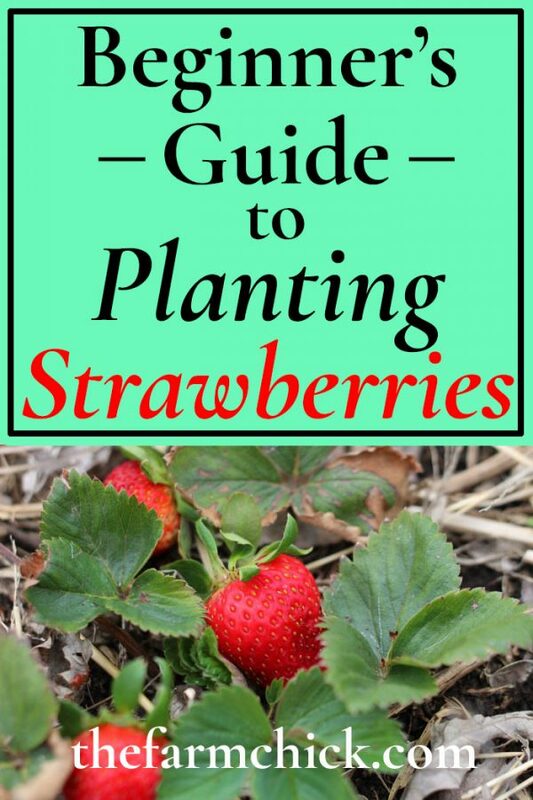 Everbearing strawberries will give you a big crop in the spring and a smaller crop in the fall. I have planted a mixture of both in the past, but this year I just wanted to get a good June bearing crop established. Years ago, I planted my first ever patch and it was AMAZING!! I planted 50 plants and I got gallons of strawberries the next May. Unfortunately, we moved that next winter and the renters decided to just mow over the patch, so it died. I have been trying ever since to establish a decent patch again and I have had the worst luck! It’s not due to my planting techniques, I assure you. At the end of this post, I’ll tell you everything that could go wrong so you can be on the lookout and not repeat my mistakes! Begin by ordering strawberries from whatever garden place you prefer. 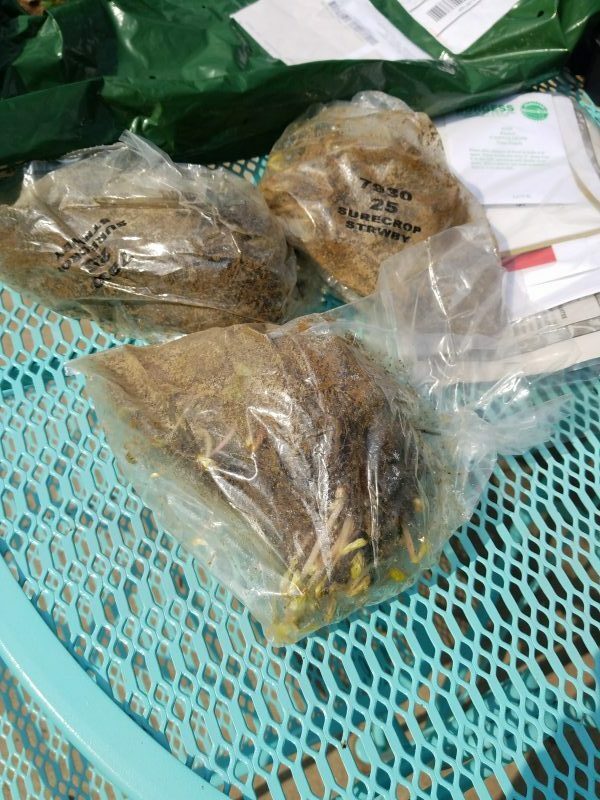 The reason for this is because you can get a large quantity of dormant plants for much less money than if you buy already started plants at a garden center or big box store. In the past I have always ordered from Gurnees, but they raised their prices a lot this spring, so I ordered my plants from Burgess. You will get 25 plants in a bundle (usually). Just to give you an idea of how big of patch that’ll make- remember, strawberries spread! 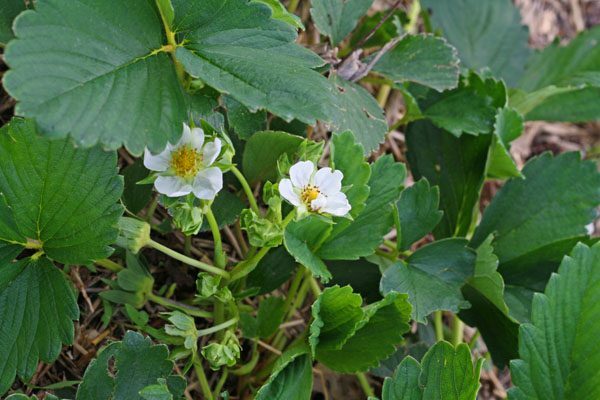 For most people, 50 plants will make you a good size patch that will reward you with gallons of strawberries. Since Jeff and the kids love strawberries and I want plenty to make jam, I planted 100 plants this time around. My strawberry patch is 5ft by 25 ft. This is what they look like when they come! Do not be alarmed if they look dead- they really aren’t, I promise! When I’m ready to plant, I fill up a 5 gallon bucket and throw them in to take to the garden. Make sure your hole is somewhat deep, like 6 inches are so. OK, here’s the somewhat tricky part that can trip up a new gardener. 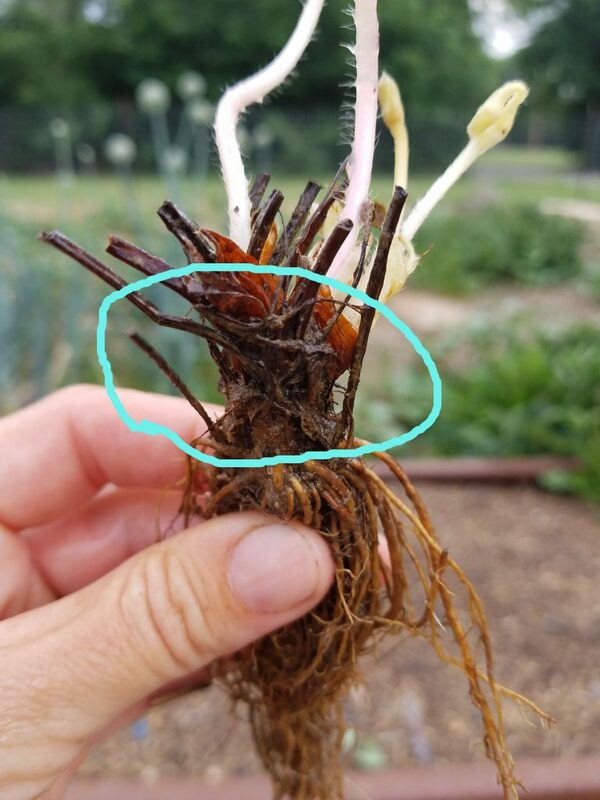 You must plant in the strawberry in the ground WITHOUT covering the crown.See that circled part? That’s the crown. So you want to bury the plant right up to it, but not over it, K? and then hold it suspended in the hole approximately where I think the soil will meet the crown after I fill in my planting hole. Does that make sense? 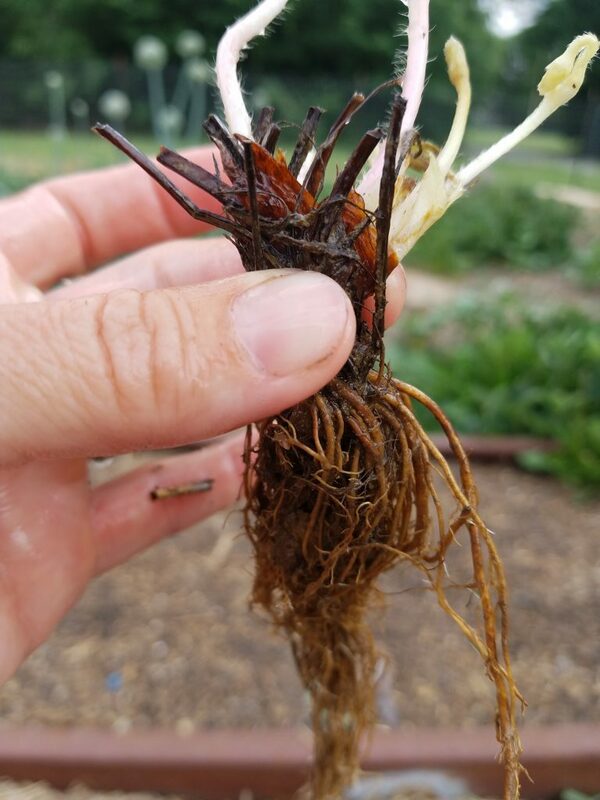 I want my strawberry roots deep for better growth and establishment, but they’re not strong enough to hold up the plant will I’m filling it in, so I hold it with the one hand and fill in with the other. 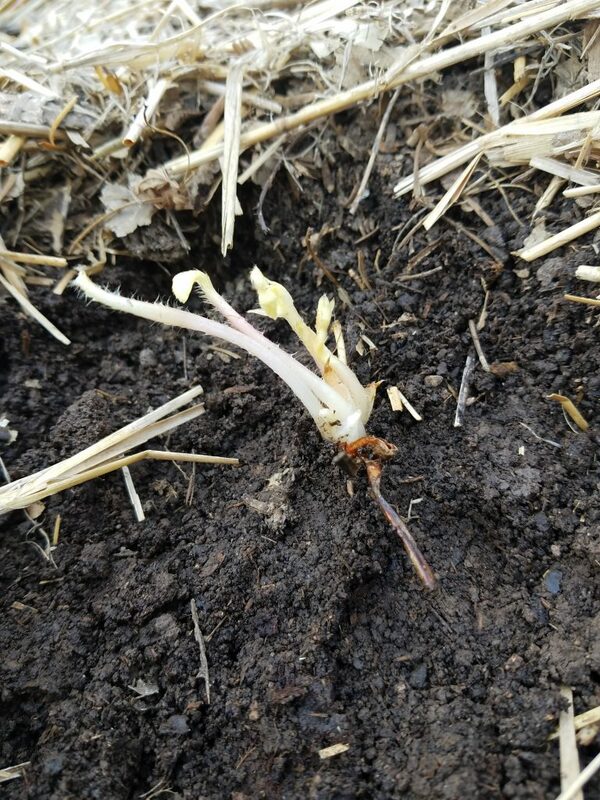 It’s kind of hard to see, but I filled in my dirt around my crown but did not bury that part of my strawberry plant. 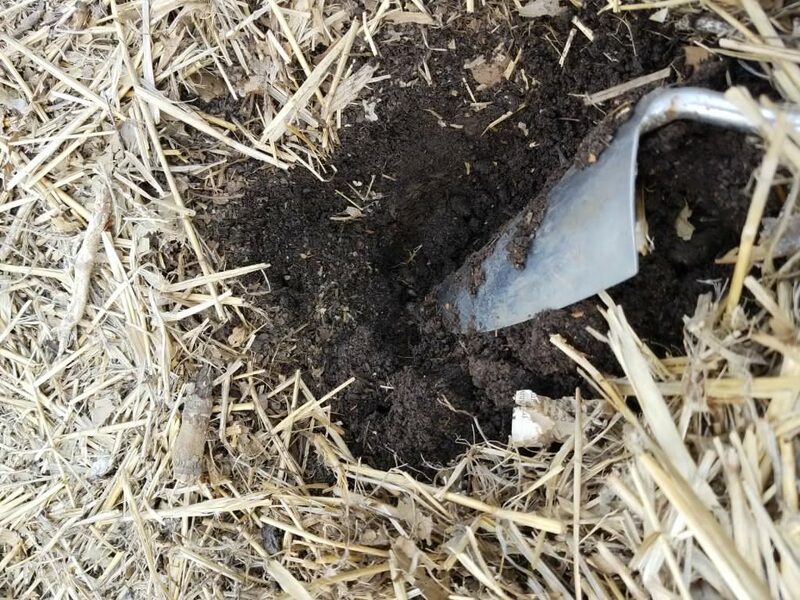 As another step, if your soil isn’t very wet, you can add water to the hole before you plant or right after. In this case, my soil was very wet and we had a chance of rain that night, so I didn’t bother with that step. Next you just watch for your strawberry to green up! 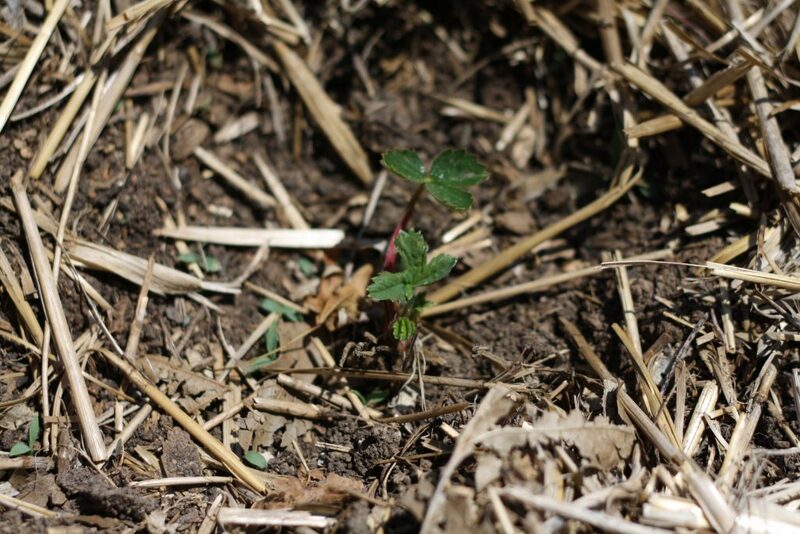 Since my soil was so warm on this replant, my strawberries only took about a week to really green up and grow. In the past when I order in late winter, I plant in later March, which means they may take a bit longer to really start growing. 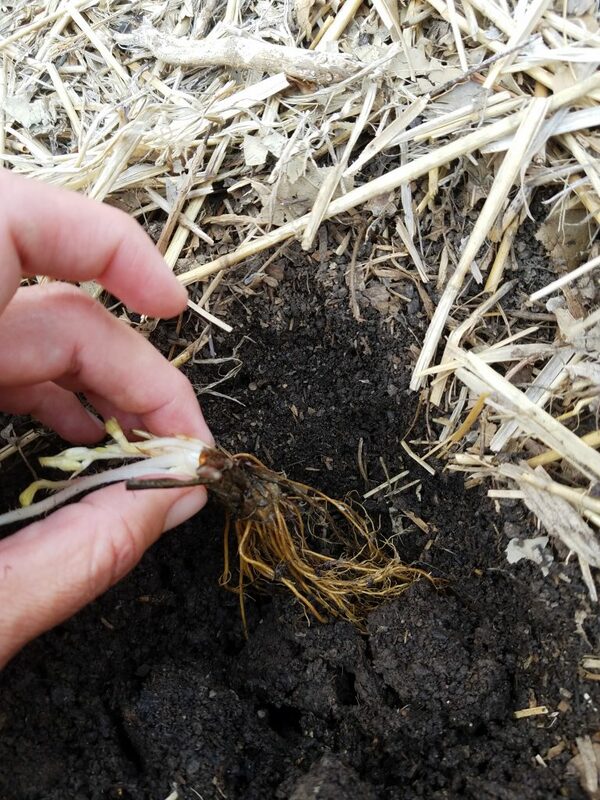 The first year you want to pick off all blooms, so that your plants can concentrate on establishing a good root system because hopefully you’ll have this patch for several years! Now, did you notice I mentioned a “replant?” Well, that’s because my luck with strawberries the last 8 years has been awful! 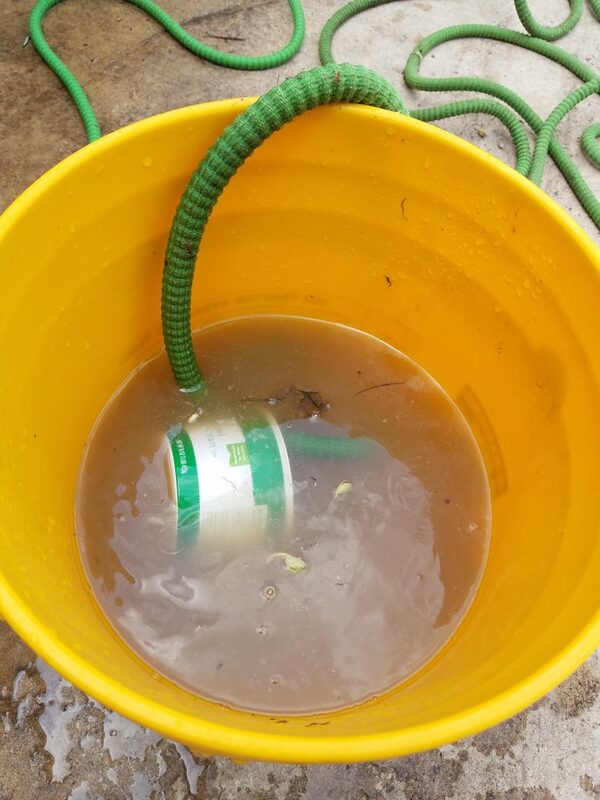 First we had a major drought from 2010-2012 and I wasn’t using my weed free garden method, my dirt was hard clay, and our well went dry, so I couldn’t water (I know, sounds like a bad country song! lol!). Then after we moved back to our old house and I got my garden going again, we had so much rain that my first planting drowned! I replanted that year and rabbits got in there and ate all the new growth. Last year, my chickens destroyed my patch in early spring before it ever really got going. This year we ended up with a super late, very hard freeze that destroyed my developing plants. Sigh… it’s been tough getting these things going! Hopefully, I’ll have better luck this year and next year I’ll be blogging about strawberry jam, right?? Order your plants online in bulk. 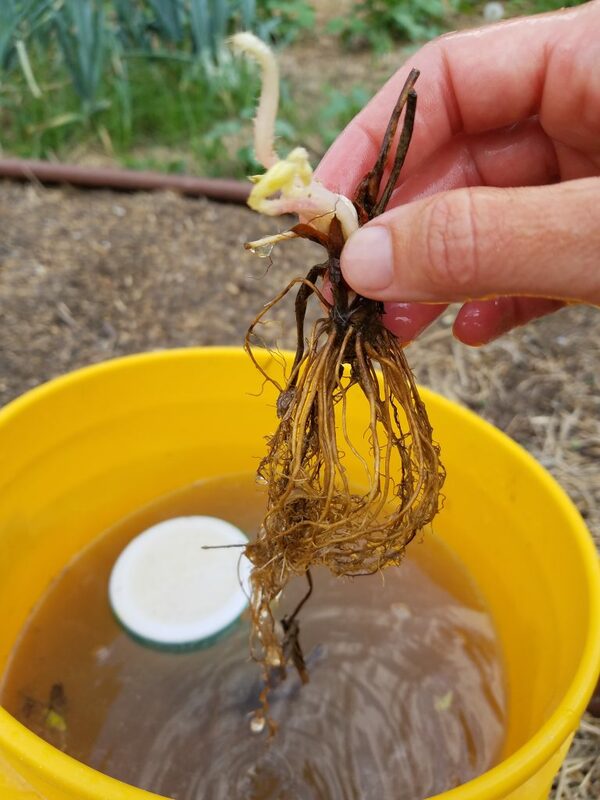 Soak them in water while you’re planting to give them a better start. Dig a 6 inch hole for planting. Plant the strawberry but DO NOT BURY THE CROWN OF THE PLANT! Water well and watch for green growth. Pick off any blooms that form. Enjoy the fruits of your labor next year! Any questions?? Tell me your strawberry stories!! Do you have any additional tips? ?